The yolk sac is one of the three embryonic cavities (chorion, amnion and yolk sac), that appears as of day 8 of human development as a transient primary yolk sac, and is situated on the ventral aspect of the embryo. Hypoblast cells are considered the developmental origin of the human yolk sac. Toward the end of the second week of gestation, the lower half of the primary yolk sac is pinched off to form the definitive yolk sac. A second wave of hypoblast endoderm cells (yolk sac endoderm) form the inner lining of the definitive yolk sac. Thus, the definitive yolk sac structure consists of a double-layered extraembryonic membrane with hypoblast-derived endoderm on the inside and mesoderm on the outside. The combination of endoderm and mesoderm layers is called splanchnopleure and appears in both the yolk sac and the allantois. The endodermal tissue supplies functioning epithelial cells, while the mesoderm generates the essential blood supply to and from this epithelium. 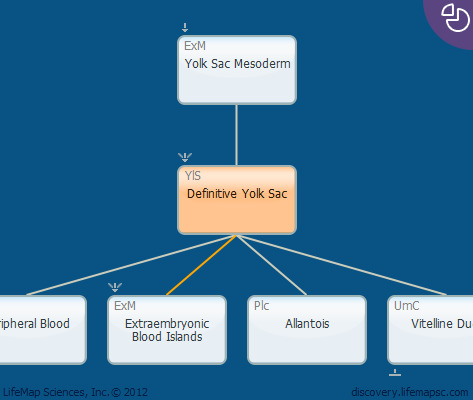 Additionally, the outer mesodermal layer of the yolk sac serves as an key location of hematopioesis in the developing embryo. The yolk sac cavity is filled with the vitelline fluid. In humans, the yolk sac normally disappears before birth (it's residues are rarely found postnatally as an anomaly called Meckel's diverticulum). Nutrients are absorbed from the yolk-sac through a complex capillary plexus and vitelline veins (the vitelline circulation) and are conveyed to the embryo. The allantois arises as a tubular diverticulum of the posterior part of the yolk sac. A constriction in the yolk sac encloses a small part of yolk sac within the embryo, forming the primitive digestive tube. Connection with the embryonic digestive system is gradually reduced to a small tube called the vitelline duct (sometimes called the umbilical vesicle).